Can You Stimulate Your Body Back to Health and Rejuvenation? What If You Could Communicate Directly with Your Cells to Achieve Optimum Wellness?Harmonize the Body into Balance and Experience Amazing Healing with Quantum Tools for Optimum Health! …and haven’t found a satisfactory solution yet? Wait no longer - listen to this super interesting show and learn about the solution to all these problems! The solution is NEW and unique and all natural to the body and very easy to apply. It can amazingly heal maladies and diseases if supported and given the correct nuturing from us. In today's world, it is more and more important that we take responsibility for our health and well-being. This wonderful tool can support you and your loved ones in maintaining a well-balanced body. 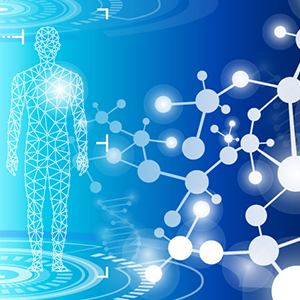 The Health Concept of the Future - Today! Are you suffering from lung and breathing problems and haven’t been able to find a cure yet? Want to improve your immune system in general and increase your stamina? Want to get rid of hormonal issues? Need to remedy your hypertension easily and without side effects? Have you given up finding a solution to your arthritis? Want to reduce wrinkles and rejuvenate your skin? Want to reduce your biological age in all organs and systems? The body is an amazing machine. It can amazingly heal maladies and diseases if supported and given the correct nuturing from us. In today's world, it is more and more important that we take responsibility for our health and well-being. These wonderful tools can support you and your loved ones in maintaining a well-balanced body. Bring the body into balance and amazing healings can occur. A total health index increase by 17%. The AQUATONE is a new device based on Russian scientific and medical research that uses UHF resonance waves to restore the correct vibratory resonance of the water molecules in the human body. Stemming from the Russian discovery in 1995 of the effects of resonance waves on water molecules, this ingenious device makes it possible to restore water's optimal molecular vibratory frequency to influence the body's metabolic processes. The effectiveness of Aquatone therapy has been tested and demonstrated by over 150 scientific and clinical studies, led by world-famous institutions such as Harvard University and the Karolinska Institute of Stockholm. The "Aquatone" device has been successfully introduced into medical practice in the hospitals of Saratov, Moscow, St. Petersburg, Samara, Nizhny Novgorod and other regions, where more than 40,000 patients have been treated. diseases of the peripheral and central nervous system, in rehabilitation after heart attacks and strokes, but also after hard physical work and exercises. Via super weak radio waves, Aquatone structures the fluids in your body, harmonizing the environment for cells, organs and systems (like hormone-, immune-, endocrine system etc), so that they can function on an optimal level - which is a prerequisite for building and maintaining health and rejuvenation. Aqautone is the perfect tool for detoxing the body. “I believe treatment with Aquatone is particularly suitable for people with my disease; ME (myalgic encephalomyelitis ) which is both immunological and neurological and affects a number of body systems negatively with distressing symptoms and extreme fatigue. With Aquatone, I noticed a faster and more tangible result in various ways. My immune system feels stronger. My urinary tract is no longer so susceptible to problems. Recovering from muscle cramps goes faster. My skin feels softer and is in better condition. I feel more stable and my sleep has improved. “I can’t thank you enough for the wonderful device Aquatone. In just over a month I’m free of some health problems completely and others, that I’ve had almost all my life, are improving. I got rid of sciatica after only 2 days. Drowsiness disappeared after 3-4 days of treatments. Sleep is much deeper and more restful. Stress is considerably reduced and now only occurs sporadically. Nasal congestion eased up after only 2 treatments. Tension and stagnation in the abdomen have significantly improved. I still have problems with my hips and a shorter leg, but also this has improved. In general, I feel much stronger, more positive and healthier. We know that all the cells in the human body constantly communicate between each other, using frequencies in the Gigahertz scale. Yet, given that cells are all in a more or less aqueous environment, and that water generally reduces or inhibits frequency communication, how do the cells manage to establish their communication, which is so essential to their health and that of the body as a whole? 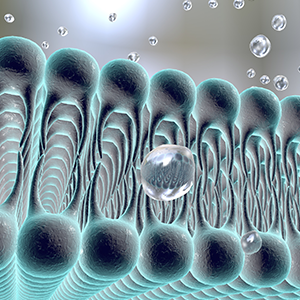 A discovery in 1995 by Russian scientists provides an answer: the secret of intracellular communication resides in the way water in the body is structured, by forming clusters of molecules that specifically allow Gigahertz communication. Since the human body is over 75% water, it's easy to see how important the correct molecular structure of water can be for our health and physical harmony. Thus, when the water molecules in the body are poorly structured, intracellular communication diminishes and the natural harmony of the body collapses. The body becomes more sensitive to toxins, has difficulty eliminating them, and health problems or illness can appear. In short, good communication between the water molecule clusters in our body is the key to good health. And that's where the Aquatone comes in. 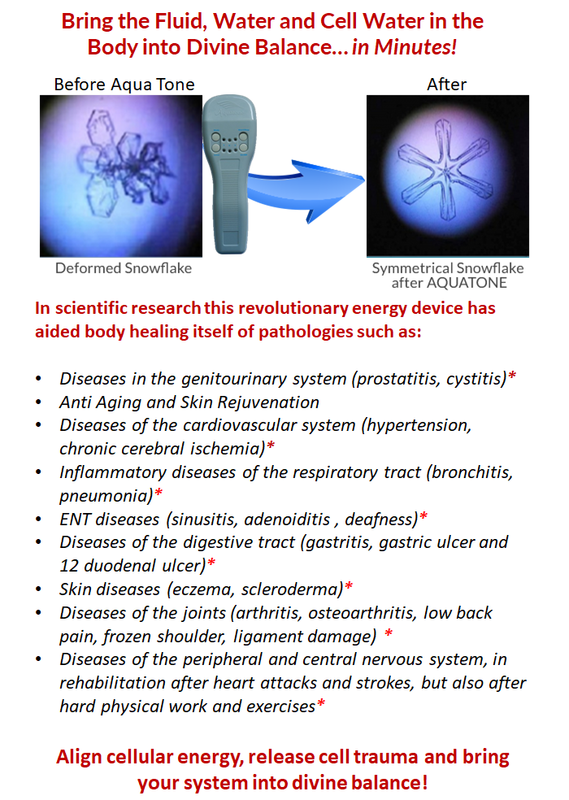 This easy to use and totally non-invasive device emits very weak frequency signals that restructure and reorder the water molecule clusters in the body, restoring optimal intracellular communication. The Aquatone couples these frequencies with specific modulations for the organs, so that it can target precise problems or disorders. Put simply, the Aquatone acts like a tuning-fork to restore harmony throughout the body. By improving the body's self-healing capability, the Aquatone stimulates healing for all types of health problems. But it's also a great tool to target injuries and fatigue due to intense physical activity such as sport, since it increases the body's resistance level and accelerates recovery. It also works well on animals. This product is a worldwide first. The technology and the concept are patented and the device has been approved by the Russian Ministry of Health. Over 150 research studies, including at the Doctorate level, have been published on the Aquatone. Thanks to the very weak intensity of the Aquatone's radiation (100 to 1000 times less than so-called 'low-intensity' devices for EHF therapy and nearly 10 million times lower than conventional UHF/SMV therapy devices), thanks also to the absence of side-effects and to good tolerance by patients, the Aquatone can be used at home. The device continues nonetheless to be used successfully in hospitals in Saratov, Moscow, St Petersburg, Samara, Nizhny Novgorod and other regions in Russia, where over 40,000 patients have been treated. ​it will not be shipped until paid in full. Please know your products will be sent from Sweden so please allow the time for the delivery system to get the products to you. Price does not include shipping or batteries which cannot be mailed. Due to medical device hygiene regulations, Aquatone and Smart Breathe™ carry a 3-day money back return policy after you receive the product(s). Unfortunately, global health regulations and hygiene policies prevent us from from accepting back any of our health device products once they have been used on the body. 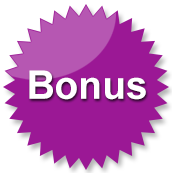 Freight costs include insurance and a tracking info link to the customer. Delivery time estimate from Sweden: Rest of the world, 1-2 weeks. 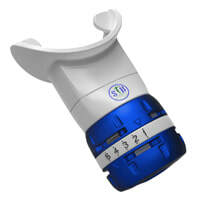 Smart Breathe™ The breathing device that helps you live longer. In today's world, people don't have hours to train every day in deep restorative breathing. Therefore, this smart device, "Smart Breathe™" was created! More oxygen into the cell = more energy for your health. It is known that the oxygen we breathe saturates the bloodstream, but often there is too little oxygen in the cells. Almost all diseases start with oxygen deficiency in the cells, which makes it very important to ensure good cell oxygenation. Why do cells get starved of oxygen? The red blood cells transfer oxygen to the cells only if there is enough carbon dioxide in the blood, and this is a common problem in today's world. Scientific studies show that most people today do not breathe correctly, mostly by hyperventilating, which means that too much carbon dioxide is exhaled. This leads to poor absorption of oxygen and possible health problems. Our breathing pattern has changed in modern society because we live under stress, eat too much, have toxins in our food, experience environmental problems and other forms of stress. The “Smart Breathe™” helps correct our breathing and ensure the right amount of carbon dioxide in the blood by providing a basis for breathing exercises using resistance and long exhalations.These help start the healing process, increase the body’s resistance and protects us against disease. Throughout life, the body consumes energy in different processes – digestion, physical work, stress, management of poor ecology, toxins … But most energy is spent breathing. An average person takes about 21,600 breaths a day, and all of this takes energy. When we breathe with breathing apparatus between 30 and 60 minutes a day, we teach the respiratory center in the brain to breathe less than 15 breaths per minute. After a few months of breathing exercises with the Smart Breathe™, we can usually reduce the number of breaths to 6-8 per minute.That means we are save energy and consequently helps increase our life expectancy. Grow Younger, Stronger…Set two Records in the National Masters! Conquered Lung Disease….Can Sing, Walk Faster…..Great 70th Birthday Present! “In 1976, I was diagnosed with a lung disease called Agriculture Lung due to mold in my work environment. My symptoms since 1976: Shortness of breath, difficulty to breathe... trouble sleeping and general fatigue.I was hospitalized for 2 months and treated with cortisone medications, but pulmonary specialists couldn’t help me. For my 70th birthday, I received a Smart Breathe™ and started using it. Unexpectedly, after just 2 weeks, I felt that I got more air in my lungs! After using the device for 4 weeks, I now can walk faster, am less tired and can even sing again. I am absolutely convinced that this little “baby” has made me stronger and given me my strength back.I will continue to use it as long as I live and it feels like a miracle indeed! THANK YOU for the little pacifier Smart Breathe™! You have improved my life!" Our body's resistance is dependent on how the immune system functions. But the immune system is also composed of cells, and thanks to proper breathing with the “Smart Breathe™” we can increase oxygen uptake by all the cells in our body, including the immune system.The immune system thus becomes stronger, and increases our resistance to and protection from viruses, bacteria, parasites, etc..
You can carry the Smart Breathe™ around with you in your pocket and use it at any time and in any context: while you wash, whilst working at your computer or watching TV, driving to work, etc. You do not need to set aside a special time to train – you can work out anytime, anywhere! Every day we brush our teeth to keep them healthy.In the same way we can keep our body healthy if we use the Smart Breathe™ regularly to give our cells more oxygen. The state of the body’s regulatory mechanisms governs our health, including the nervous system, the state of which is crucial to how we feel. 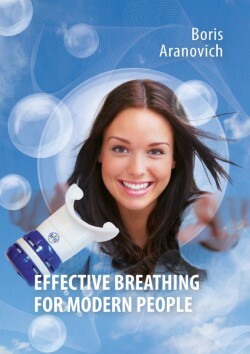 The Smart Breathe™ and effective breathing strengthens the nervous system and thereby our health in general. These results were achieved after only two months of breathing with Smart Breathe™. You can read the full report, ”Effects from Smart Breathe™ in a rest-home for the elderly, New Delhi, India, 2013. Boris Aranovich has written a fascinating book that gives us practical recommendations on how to use breathing exercises to normalize the body’s functions. Built on his long experience of using various breathing methods, Boris developed his own breathing methods which include breathing with a breathing device - SmartBreathe - and breathing while doing certain physical exercises. The book is a very interesting, easy to read and is meant to be a practical tool for improving personal health and rejuvenation. FB private group to support and help you with any questions re how to use the devices and also if you’d like to share your success stories with others there. Boris Aranovich is a Russian- Swedish scientist, a radio show host, an internationally acclaimed speaker in the alternative health field, a well-known author of 14 books, including “Effective Breathing for Modern People", Doctor Mind” and “Be the Master of your Health”. Boris has been professionally active for 40 years within the field of alternative medicine and has created a number of therapy- and wellness modalities used by thousands of people worldwide. Boris continues to develop new innovative health practices at his company Manniskans Resurser AB. 1987 -1991, Principal at the University of Alternative Medicine, St. Petersburg, Russia. Boris Aranovich has earned a Master's Degree from the International Academy of Ecology and Life Protection Sciences (IAELPS). Boris Aranovich is the author of 14 books and 3 interactive programmes about health. Annette Graucob, Marketing Director at MR AB.She spent the first half of her professional career in the international media arena. But some 15 years ago, her focus and passion turned direction completely - empowering people to find their inner strength and joy became much more important. Annette is now able to do so as an intuitive artist and as a co-worker at the innovative alternative health company MR AB, which focuses on helping people to restore health and happiness.